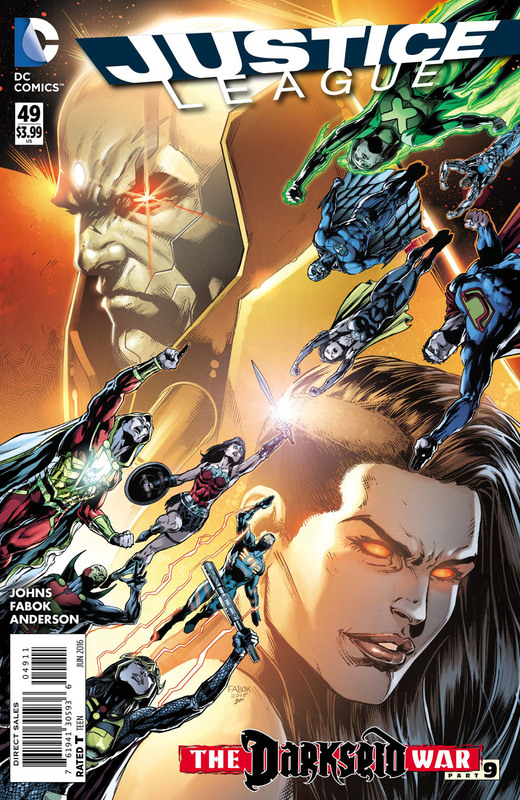 "Darkseid War" - Chapter 9: "Power Mad"
The Justice League and the Injustice Gang have a tense cooperation going, as they try to stop Mobius and his destructive path. However, it is the birth of Superwoman's child which holds most of the story, which is then supplanted for the arrival of Grail, and her newly corrupted super-weapon, Steve Trevor, who destroys Mobius with a massive blast of energy. Mobius is removed from the playing field, but new troubles have arisen in the form of Trevor, Grail, and the son of Superwoman. Story - 3: The story lost me with Grail announcing her return, stating "We're Baa-aack". There is more action per panel in this issue, than one would normally see in months' worth of comics, and it means absolutely nothing. The storyline is so long and slow, we know what becomes of every character here, thanks to solicitations for July's DC Comics slate. Johns spends so much time building to the delivery of Superwoman's son, and when the baby arrives, nothing occurs. It's just a splash page moment of wafer thickness, ad worth. It's mind-boggling how "The Darkseid War" came to be an ongoing train on the track to nowhere. It started out very strong, then decided to jump into the jaws of defeat for reasons unbeknownst to this critic. 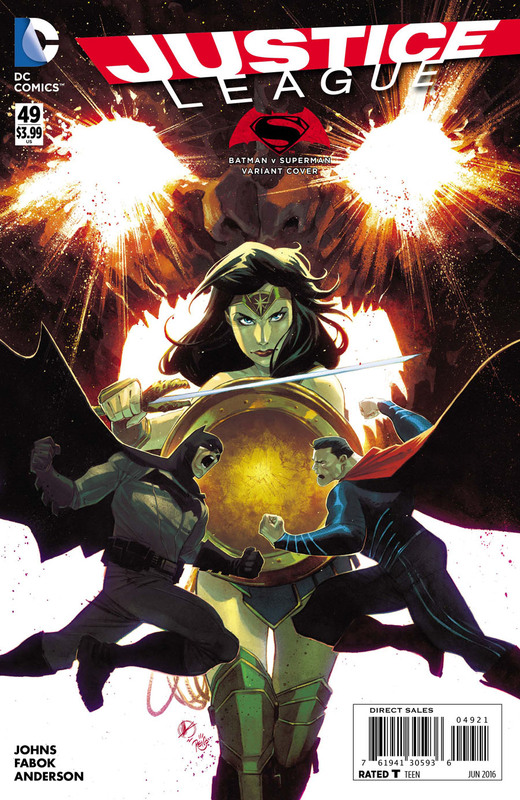 Johns has decompressed the story to the point it's no longer even relevant to the DC Universe, as most if not all books have moved on to their own storylines, and away from any tangible connection to this one. Johns may hold a master stroke that will only be displayed with the closing issue, but after several issues, mini-series tie-ins, and specials, readers who have patiently followed this storyline deserve better than what has be given thus far. Art - 4: Once more, Fabok's line work is worthy of envy, but he's illustrating a story that is substance free, making his efforts a lovely lampshade on a lamp-less light. Cover Art - 3: Captain Marvel's new outfit looks terrible. Aside of that, none of what's shown on the cover occurs, adding misdirection to the list of the book's offenses.